BEST SELLER! The Tinner's Revere Lamp with Shade is an affordable lamp for your Colonial or Country home. 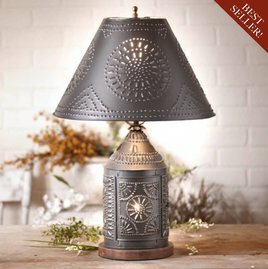 Designed by Irvin Hoover this lamp will bring a warm glow to any room in your home. Smokey black finish.